It's Monday morning and you're late for work. So late, in fact, that you've only remembered that you've forgotten your house keys when pulling into the company lot—better start looking for a locksmith. Or, better yet, install a deadbolt that doesn't need keys. A networked, electronic deadbolt that can be toggled using a key, an integrated keypad, or a smartphone. Home automation enthusiasts running the Nexia (or similar Z-wave standard) system, people who routinely only remember to grab their keys after the door locks behind them (*raises hand*), or security-minded homeowners that prefer not to hide a key for the cleaners. 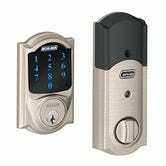 The Camelot series deadbolt consists of two halves—an interior unit containing the electronic guts, power supply (4 AA batteries), bolt servo, manual lock knob and a weatherproof exterior component incorporating the illuminated touchpad and lock tumbler. The locks are available with either an aged bronze or nickel finish. Once the lock is installed, setup is as easy as inserting batteries and registering the device with your Nexia account. The lock arrives with a pair of keyless entry codes pre-programmed. These can easily be personalized to a more familiar four to eight-digit sequence, though the lock can accommodate as many as 30 unique access codes. What's more, each code can be tailored to only grant access on specific days and times, allowing you complete control over who gets in and when. And for unwelcome visitors, the Camelot is also equipped with an alarm that can be set to sound when the lock is activated, tampered with, or forced open. With three methods of authentication (key, code, and app), you're practically guaranteed to never get locked out again. And by enabling the auto-lock feature, you won't have to fret about leaving your home unlocked when you leave—just close the door and the lock secures itself. Installing the unit can prove quite an adventure. While the Camelot is designed to fit easily into standard deadbolt slots of newer doors, adapting an existing cutout to fit (which involves boring a new hole in the door) may be beyond the ability of the average DIY'er (*raises hand*). You'll have to disconnect the System Bridge from your router and keep it within six feet of the lock when registering the device (to be able to use the Nexia Home smartphone app and enable remote unlocking), which is a bit of a pain compared to the Iris system we've reviewed previously. 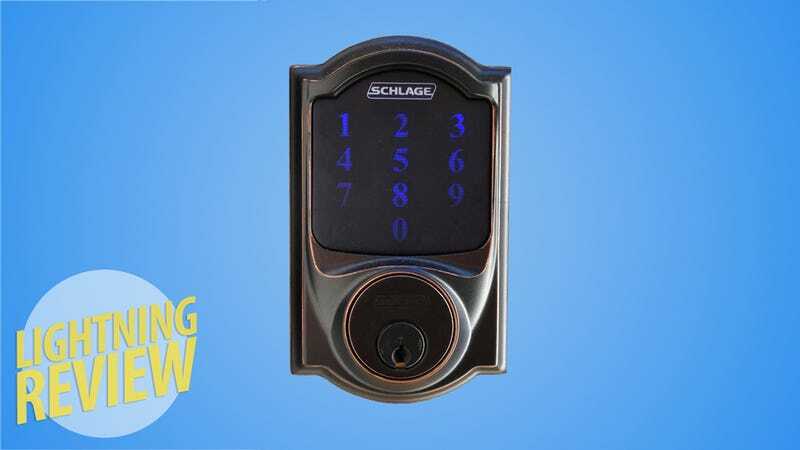 Secure the deadbolt from the outside by pressing the Schlage logo. Auto-lock feature requires up to 30 seconds to lock after you close the door. Entering a keypad code is actually faster than using the key. Installation difficulties aside, and even if you don't spring for the whole Nexia Home system, this is a great lock. The added technology provides an extra layer of functionality that doesn't hinder the device's basic functionality or performance.